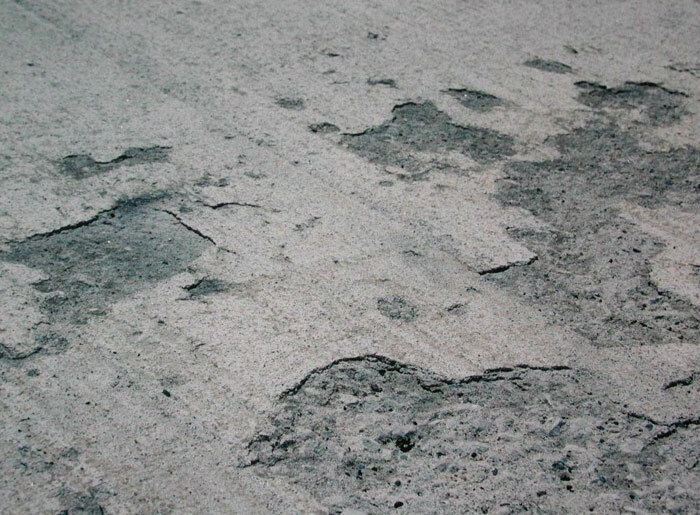 Scaling is flaking or peeling of a finished hardened concrete surface as a result of exposure to cycles of freezing and thawing. Generally it starts as localized small patches, which later may merge and extend to expose large areas. Light scaling does not expose the coarse aggregate. Moderate scaling exposes the aggregate and may involve loss of up to 2.5 to 10mm of the surface mortar. When severe scaling occurs the coarse aggregate is clearly exposed and some of it may eventually pop out. Note: Occasionally air-entrained concrete peels or scales in the absence of freezing and thawing. This type of surface blistering or delamination is not covered in this article. 2. Why Do Concrete Surfaces Scale? The use of non-air-entrained concrete or too little entrained air. Adequate air entrainment is necessary for protection against freezing and thawing damage. However, even air entrained concrete will scale if other precautions are not observed. Early age application of calcium or sodium chloride deicing salts. If other salts such as ammonium sulphate or ammonium nitrate (fertilizers) are used, they can cause scaling as well as cause severe chemical attack of the concrete surface. Any finishing operation performed while bleed water is on the surface. If bleed water is worked back into the top of the slab, a very high water-cement ratio and, therefore, a low strength surface layer is produced. Insufficient or no curing. This omission often results in a weak surface skin, which will scale if it is exposed to freezing and thawing in the presence of moisture and de-icing salts. To prevent scaling the use of air-entrained concrete is a must. Flatwork exposed to deicing salts requires air contents of 5 to 8% in freshly mixed concrete made with 14 mm or 20 mm coarse aggregate. Air-entrained concrete having a low water cementing materials ratio, a minimum Portland cement content of 300 kg/m3 and moderate slump (up to 125 mm) helps produce a strong wear-resistant surface. DO NOT perform any finishing operations with water present on the surface. Initial screeding must be promptly followed by bull-floating. Provide proper curing by using liquid membrane curing compound or by covering the surface of freshly placed slab with wet burlap and polyethylene sheets or a non-woven geotextile. Maintain the concrete temperature at a minimum of 10C for at least 7 days. Curing ensures proper hydration (reaction of cement and water), which allows the concrete to achieve its highest potential strength. Protect concrete from the harsh winter environment. It is important to protect the young concrete from becoming saturated with water, prior to freeze and thaw cycles of the winter months. Seal the surface with a reputable commercial surface sealer specifically designed for use on slabs-on-grade. The concrete should be reasonably dry, prior to the application of a sealer. CSA recommends a one month drying period following curing. Late summer with at least 1 month of drying post-curing preceding application of the sealer is ideal. Follow the manufacturer’s recommendations for surface prep and application of sealers. DO NOT use deicing salts, such as calcium, magnesium or sodium chloride, on new or recently placed concrete. Use clean sand for traction. Never use ammonium sulphate or ammonium nitrate (i.e. fertilizers) as a deicer; these are chemically aggressive and destroy concrete surfaces. Poor drainage which permits water or salt and water to stand on the surface for extended periods of time greatly increases the severity of the exposure and causes scaling. (This is often noticed in gutters and sidewalks where the snow from plowing keeps the surface wet for long periods of time). Light applications of salts can be more damaging than heavy applications; even salts carried on cars may cause severe scaling of newly placed driveways and garage slabs. The repaired surface will only be as strong as the base surface to which it is bonded. Therefore, the surface to be repaired should be free of dirt, oil or paint and most importantly it must be sound. To accomplish this use a hammer and chisel, shot-blasting or jackhammer to remove all weak or unsound material. The clean, rough, textured surface is then ready for most resurfacing product solutions. Contact your local concrete repair productdealer for more details. Select the proper mix to match placing conditions. For moderate to severe exposures, use air-entrained concrete of moderate slump (80 – 100 mm) and cure properly. Use correct timing for all finishing operations.